Over the years I have struggled with buying gifts for women in my life. What would she like, what is she into, what size, what color…. What was I thinking is more like it. Somehow a switch flipped and I started listening to what they said year around, how they complemented me on something they liked, but overwhelmingly most comments, questions and inquiries centered around beauty products and skin. Getting complemented on my skin feels so great, especially since I was not always blessed with good skin. It has been a long, tough road from acne to clear skin, but I am here and committed to skincare. Acne prone, I first tried the glam glow line of products by using their purifying mask and liked it. Second one I tried was gravity mud and it is my top favorite. Last year was the first I saw gravity mud glitter and in honor of #monthofsparkle I tried it. Same great results with glitter. Large jar of glitter mask pictured here is $59 at Nordstrom. 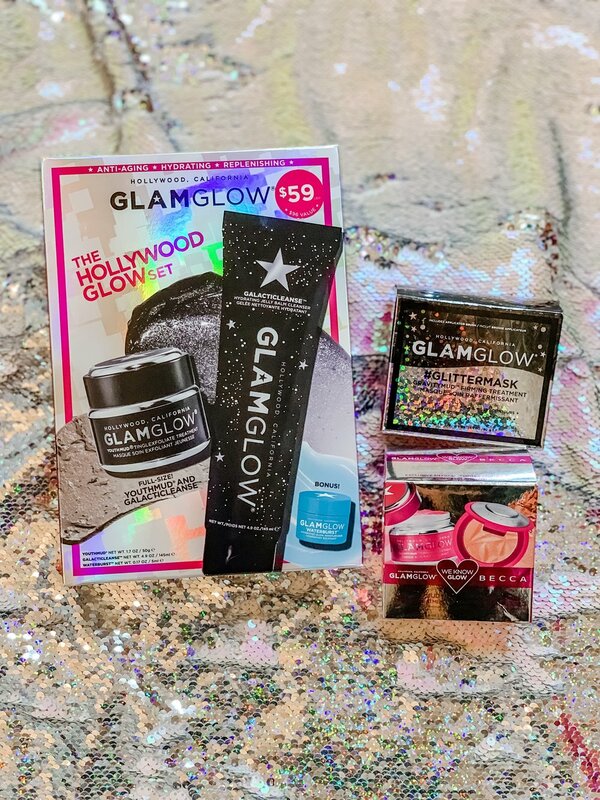 Pink gift set, We know glow is all about glowing skin, a gift for my mother in law at $16, and Hollywood gift set pictured here for $59 was actually $41 and give to me. Around Christmas Nordstrom has wonderful glam glow gift sets and great way to try more than just one of their products. Checkout company site as well for EVEN MORE sets and start your glow collection. For Winter/Holiday season these masks hit all the most important aspects of skincare so I can look holiday ready. Find your fix so you can Be Awesome and Sparkle. Gravitymud glitter mask is a Firming Treatment with fun added in form of glitter. Checkout Glam glow site about this product. It has licorice and marshmallow complex in it too. Dessert without calories !! !